What is your "Secret Sauce"? What does your brand have that all the others don’t? Periodically fear seems to seize the furniture industry. A few decades ago it was Levitz... a decade ago it was the dot coms. Today it is factory stores and Chinese merchandise. 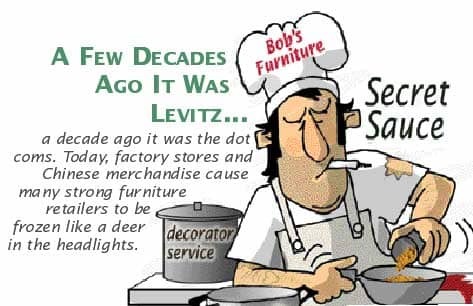 Many strong furniture retailers are frozen like a deer in the headlights. What is the solution to the perceived threat? The solution is to return to the Secret-Sauce that made your store special in the first place. Here are 12 ways to help you thaw the creativity that will help you survive -and to flourish as never before. 1. Revisit the “Secret Sauce that makes your store unique. I have the opportunity to talk with a great number of furniture entrepreneurs. Over the course of many years, several of these have come and gone. In virtually every case in which the business of a seasoned furniture professional begins to slip, it is because he or she has lost “the eye of the tiger”. They forgot what got them there in the first place, and they begin to compromise and take short cuts. In the current atmosphere of the furniture industry, it may be helpful to rethink the need for innovation. Not in the sense that you need a new gimmick. It may be that you have gotten soft on redefining and driving some of the unique factors that attracted people to your store when you first set your business into motion. Lets go back to the original topic of this article. Revisit your Secret-Sauce and review it carefully. What ingredients are now being neglected? Remember, your leadership is the only thing that will keep your Secret-Sauce zesty, vivid and alive. 2. Brand your store by stating, and restating, your Secret Sauce ingredients. If your advertising is not driving home the message of your Secret-Sauce, you are not building your brand. Coupons, credit offers, price guarantees and other gimmicks are now table stakes. The branding concept itself is not new, it is as old as retail. Many stores spend a fortune to create and promote a cute, fluffy statement or “slogan” that could be made with equal validity by any competitor. This is not branding. Successful branding occurs when you make a statement about your store that no competitor could make about theirs. Cute, catchy sayings, in and of themselves, are paper thin and virtually meaningless. Your Secret-Sauce is your unique, one of a kind Grand Vision. Everything stems from that. Avis created a great brand by simply saying, “We are #2, We try harder,” and then following up with passion and dedication. That statement could not be made by any other competitor. Your Secret-Sauce is a combination of many special ingredients. What often happens is that we get tired of telling people about our unique factors. Or, I should say, we get tired of reminding sales people, delivery people and advertising people to tell other people about our unique factors. One of the most common unique factors is years in business. “Serving the (City) area for 25 years.” Or “25 Years (City) area's headquarters for home furnishings.” You may get tired of saying it, but I am sure newly arriving competitors rejoice when you don't. It's not a question of loyalty. It's common sense. If you are looking for a plumber, all other things equal, would you call the one who has been around for 25 years or the new guy? 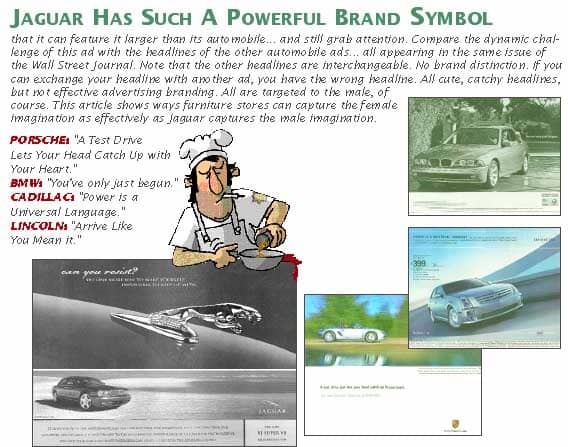 Check out the exhibit of the ad for Jaguar automobiles in this article. Note the fusion of the symbol with the challenge: “Can You Resist?” and the promise: “One more way to make yourself impossible to keep up with.” What makes this ad unique is the overpowering use of the dramatic symbol that means Jaguar, and can only mean Jaguar. Its power comes from the creative use of the Secret-Sauce symbol married to a dramatic promise. Compare this with the other look-alike automobile ads with their cutesy, interchangeable headlines and copy, all in the same issue of the Wall Street Journal. Some furniture people might protest: “But furniture doesn't lend itself to such dramatic use of illustration and promise.” Not to the male mind, perhaps. But, note the Ethan Allen exhibit. Absolutely smashing furniture branding. The melding of family, casual, elegant living and the Ethan Allen logo. And, you better believe this advertising flyer is every bit as exciting to our target customers’ mind and heart as the Jaguar advertisement. But let's check out the other 10 ways I promised you would thaw out your creativity. 3. First and foremost are People Media. They are the most powerful media of all, and they are free. You can read a more detailed description of how to use People Media in past articles posted to the Marketing Management article index on www.furninfo.com. To use people media, you need only communicate the ingredients of your Secret-Sauce to your staff. You need more than just words to get the point across. You also need the proper actions, enthusiasm, and attitude. The words to use that will inspire your associates can go something like this: “This is a great place to be, a great place to work. We are unique. We can take it to another level.” You exude confidence and love, when you communicate this. And this can-do attitude will be picked up by your managers, and they will relate it to all your associates. Then, your sales consultants will tell your guests all these unique factors. (No, they are not customers, they are guests. Make sure everyone understands that). Having absorbed this message and the new spirit of your organization, your support staff and delivery team will, as well, reinforce this important message. Finally, every delighted customer will pass this message on to at least twenty friends. And new customers will come. Sound too easy? People Media take more time to work than most direct media, but they are the most powerful media ever created. And, if you had started a regular people media program six months ago, you would be feeling the benefits today. 4. The Delivery and Sales Staff. As more and more of the big chains rely upon hired guns for delivery, the opportunity to do a better job becomes more promising for the independent furniture retailer. First of all, supply uniforms. Then: White gloves and a piece of red carpet. And then train them to fulfill the important task of likely being the final contact in each shopping experience your customer has with you. Teach them to dispel any possible buyer's remorse by making the final sale. This is done with a few comments, such as: “What a beautiful sofa! You made a great choice.” If you charge for delivery, it should not be a problem. What you provide, whether you charge for it or not, is “Professional, white glove, red-carpet delivery.” Does this sound far out? Curtis Bros. became the largest furniture store under one roof in the sixties by providing special touches such as this. Curtis Bros. was the “Home of Red-Carpet, White-Glove Delivery.” And, it would be common to hear over the speaker system at Curtis Bros.: “Mr. Jones, you have a guest in the bedroom department.” You never heard a comment on the floor such as: “Hey Joe, do you know where the advertised dinette is?” Every person was either “Mr.” or “Mrs.” someone, and every sales consultant wore a Curtis Bros. blazer with black pants and shoes. There was a unique prestige to being a Curtis Bros. sales person. Each one of the 36 sales consultants had his or her own desk and telephone. 5. In Home Design Service. If you can provide this, be sure to always mention it in your advertising. If you are a small store, a single design-trained consultant can handle the calls for you. A good program will follow a step-by-step procedure: (a) The client interview, (b) The house call and the measurements, (c) The trip to the store by the client to see the floor plan and to make major furniture choices, (d) accessorizing choices and (e) the close and financing. One Large Denver store has this down so well that they close over 90% of their house calls. 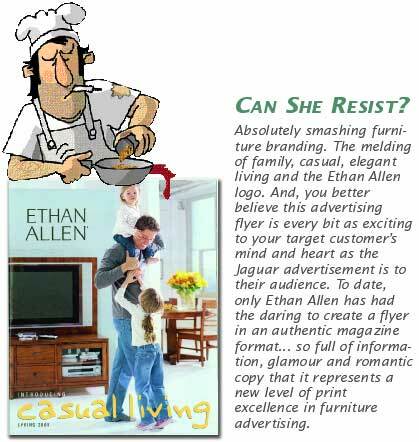 Of course, house calls are also Ethan Allen's bread and butter; it is featured in every flyer they produce. Look into it, you can do it too. 6. Have a Worry-Free Guarantee. Most stores accommodate reasonable client complaints. But they usually have a huge array of guarantees with disclaimers explained in a great deal of small print written by a lawyer. Don't do it. The best guarantee is simple and puts all the risk on you. Not to worry. You can still deal rigidly with the few nut cases who will not be satisfied regardless of what you do. But, don't let these nasty few set your standard. Consider this: “Our Promise Too You. SATISFACTION. In Price. In Quality. In Service. No Small Print.” - Joe Entrepreneur, Owner. Sound too far out? Tell it to Nordstrom. 7. Terms. Let's be creative here. Step-ups can be developed by pointing out the small difference in the monthly payments. Now, think about this. You probably offer 18 months equal payments with no interest routinely. It costs about the same as 12 months NO, NO, NO. You can even offer a choice of the two. But when it comes to the 18 month deal, take a hint from car dealers. They routinely offer 0% financing and make a big deal of it. You can offer a $1,500 leather sofa at 0% interest and payments of less than $100 a month. If they like the $2,000 sofa it's not much more per month. State this kind of monthly payment idea in your ads, and have sales consultants use it to close and to step-up clients. 8. The Fashion Package Savings Plan. This is an old one, and a very successful and safe way to offer important discounts. Price each item in a room group separately at a healthy markup, and then offer the entire package at a big discount. Allow guests to choose from several table and lamp styles. Some retailers are picking this up, but I always encourage my clients to use a creative handle and special price tag such as “Our Fashion Package Savings Plan.” The advantage is obvious. It's more dynamic, and it says it all. If the tag implies that the room package was put together by a decorator and its fail-safe, that's even better. 9. Referrals. Have your sales consultants routinely send out cards to their clients just to say hello and remind them of some new arrivals in the store. And also to add: “The greatest honor you can bestow upon our store is to suggest us to a friend. Please do so, we look forward to serving them.” Add a reward of some kind for the referral if you want. A routine referral system of some kind is sure to increase sales. Not only does it remind old customers that you are there but it also gets priceless new ones. 10. Direct Mail. Direct mail is becoming a more important resource for the smaller furniture retailer. You should plan on six direct mail communications a year. Consider sending out a newsletter when you return from major furniture shows to inform your clients of all the wonderful new merchandise that will be rolling in. Make a special mailing to prospective customers who are not on your mailing list. In some markets, ADVO may offer feasible low-cost alternatives for smaller furniture retailers who can't reach prospects any other way. 11. Community Interface. You are imbedded in your community. You are in a position to offer free seminars on home furnishing purchases, decorating, mattress selection, and so on. A regular program of bringing high school classes into your store can help build good will, cultivate future customers and possibly future employees. Materials supplied by factories can be used, and factory reps can often be persuaded to teach classes. There are other ways to interface with the community. The Slumberland chain gives free mattresses to impoverished families in their communities each December. here are lots of other ways to be good citizens, and to let people know you are their friends and neighbors. 12. Tap into your most powerful and most under-used asset. Important and timely innovations can come from your staff. Creative ideas will come pouring in if you ask for them. Have a meeting, and relate these 12 general ideas. Challenge them to come up with 12 more in a half hour. Write them on a board. Remember the three simple rules of brainstorming: (a) No idea can be criticized. (b) Each idea belongs to everyone, so you can “hitchhike” your ideas on someone else's. (c) It is OK to “plus” someone else's idea by suggesting ways to improve it. And then, delegate teams to pick up a category and make a feasibility study of the best ideas and then report back what they find. In this way the staff will have ownership of the various programs you set into motion. Give it some thought. Here is one very important final suggestion. Get completely away from the grind for a short time each day and think about what ought to be. This is your vision. It may be far removed from the way things are today. But if you develop a clear vision of what ought to be, and begin to communicate it with passion and conviction, you will come to realize that you have more resources at your fingertips than you might otherwise believe. And when you understand that, the creativity will begin to flow again. When you rekindle that faith in yourself and your associates, creative options begin to emerge from everywhere. Possibilities that you didn't see before define themselves, doors suddenly open, and the people and opportunities you need, will start to appear from unexpected places. It's true.